Bryony Frost, 23, made front-page headlines with a landmark victory on the Paul Nicholls-trained Frodon at the Cheltenham Festival - she was the first woman to ride a top-level Grade One winner over jumps at the meeting. 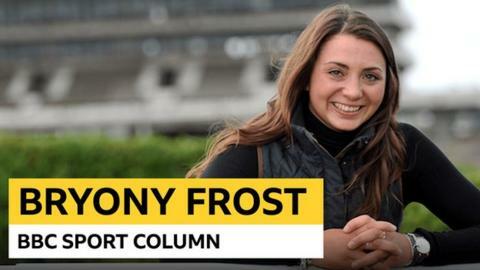 In her second BBC Sport column, the Devon-born jockey talks through the "perfect" race in the Ryanair Chase, not realising she had made history, the "cool" media coverage, celebrating at a service station and hopes for next year. Cheltenham is where our most exceptional equine athletes showcase themselves as the bravest. When your horse becomes the best in his race, as Frodon did in the Ryanair Chase on Thursday, it's a proud moment for you, the team, and everyone behind him. I was a right kid when I turned up at trainer Paul Nicholls' yard in Somerset three years ago - I wasn't a very worldly wise person. I was 20 and had come up from Devon for the first time in my life and was a little bit lost. There were a lot more people around and trying to fit in was difficult. We stopped at Gloucester Services on the way back. I had a burger and a Coke - an elite athlete's diet, eh? But the yard has become like a second family. It's not just a couple of minutes racing with us out there. It's the six months beforehand. Shelley [Michelle Kramer] looks after Frodon every day and was in tears afterwards. Holly Evans rides him every day, Harry Derham is the assistant trainer. Paul has his routine and training. Pyramids are not built from the top. Frodon had to battle hard for the win - he really wanted it. This wasn't a case of it being gifted to him. He deserved every minute of it. He's an incredible, incredible horse. The parade before the race was so funny. 'Frod' is quite the boy and Harry has to take hold of him, while I'm just sitting on top giving him pats. If you put a pair of rollerskates on Harry, he'd shoot off. 'Frod' loves the parades - he's a showman. The race itself went perfectly. At the finish, it all goes quiet, and then I lean down and say: 'Mate, you've done it.' We are the best. We have beaten them all. That's the moment you live for. It's what makes your heart beat. When I triumphed on Pacha Du Polder in the Foxhunter Chase two years ago it was a massive thing to say I'd won at the Festival. I was young then. Pach held my hand and it was great to get his picture on the wall. I appreciated it more this time because I know how hard it is to be at the top at the Festival. I was that wrapped up in the win, I forgot what race it was. I had no idea I was the first woman to do what I'd done - I only realised when someone said it when I was getting the trophy. I said: "First what!? Oh my God." Grade One races are a massive thing all season, so when you achieve that, it's huge. Frodon had made a fairytale become reality. My family were there and we stopped at Gloucester Services on the way back. I had a burger and a Coke - an elite athlete's diet, eh? The burgers are really good there and we had great conversation. Everyone was there - mum, dad, my two brothers - plus Bob, who drives, and our head lad Dave. The day after a race isn't perfect until you know your horse is 100%. I sent the yard's overall head lad Clifford Baker a text and he replied that he was "perfect - happy as you like". I've probably watched the race 30 times at least since - I have to make sure it happened every time. It's a memory you live for, and one you will look back on if there are darker days. The coverage has been cool. If people want to run with me and see my world a little bit from my eyes, it's awesome if they can see how we feel about horses and what they mean to us. That's why I don't mind giving time to everybody. There is nowhere I'd rather be than with my horses. It's that moment when both your bodies are at maximum effort, and both your hearts are full of adrenaline. You have to be 100% in sync and that's something me and Frod have got. I get him and he gets me. He's as happy as Larry. He had a banner made for him with aeroplanes and stars on it, and he's proceeded to eat half of it. Horses need patience, love and looking after. My job is to try to help them achieve their best. They love to win as much as we do. After the race, Frod was buzzing. He passed his stablemate Modus and squealed and bucked. He was on top of the world. He's only seven - he's got a wise head on young shoulders. His body is stronger and he's becoming more mature and professional. Who knows where he can be next year? The team at home know him really well so he's 200% ready when he goes racing. The Gold Cup is an option, it will always be a card on his table. He will stay three miles, and maybe when he is more mature, his staying power will increase. The older you get, the wiser you get. Who knows his path? Racing is a brilliant sport because it allows us to play off a level playing field. I'd have it no other way. It doesn't matter whether you are a boy or a girl - it's the way you ride and whether you are the best, and winning at the Festival shows you were the best in that race. I can't talk for everyone but I would ride the same whether I was a boy or a girl. To me, it doesn't matter. I do what I do. Next month is the Grand National, but I might struggle to get a ride. I was fifth last year on Milansbar - the best of the Brits - but we'd need 43 horses to withdraw so we might be denied a chance to run. Milansbar - or Mars Bar as I call him - is an old gentleman now who is just fantastic. I would love to take him round there again. It cries out for him, but I think he will struggle to get in.